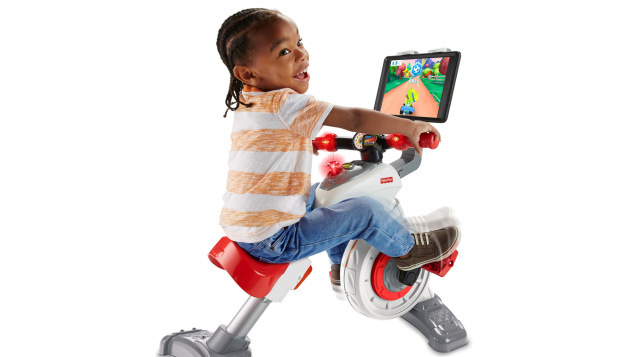 Weighty Matters: Fisher-Price's New Kids' "Smart Cycle" Is All Sorts Of Huh? Fisher-Price's New Kids' "Smart Cycle" Is All Sorts Of Huh? With press coverage extolling that they can use it to "burn off the sugar", or "battle obesity" last week Fisher-Price released their so-called "Smart Cycle" geared towards kids between the ages of 3-6. It's a stationary cycle with a built in stand for a tablet so that kids can play "learning" games while they sit in one indoor spot pedalling. Because toddlers aren't much for active play? Because electronics need to be part of every single aspect of even the youngest child's life? Because little kids should be made to feel like they need to burn off their calories? If you want your toddler to be more involved in active play, play with them. And if you're genuinely unable to (due to time/work/health/whatever), and you've got the money to spend on a "Smart Cycle" and a tablet, maybe invest in kids' shoes, outdoor clothes, actual bikes, jump ropes, balls, or really anything that gets them moving, having fun, improving their physical literacy, and developing their imaginations.